You know this isn't the way it was supposed to be, right? People look back to the day Justine Henin retired as the flash point of the chaos in the women's game...people have it wrong. Yes, Henin was a seven time major champion and the No. 1 player in the world when she inexplicably pulled the rip cord just shy of Roland Garros in 2008. Like any successful company, there was a natural, clear succession plan in place. The woman who would become No. 1 (again) was Maria Sharapova. Sharapova was a three time major champion and had just won that year's Australian Open in a ruthless display that saw her win every set she played and finish off the now World No. 2 Ana Ivanovic comfortably (7-5, 6-3) in the final. Ivanovic, for her part, would win Roland Garros just weeks later. Svetlana Kuznetsova and Serena Williams were still in the Top 5...then, the Sharapova shoulder injury. Forget that Serena would play less, Kuznetsova would become increasingly erratic and Ivanovic would fall as quickly as she rose. 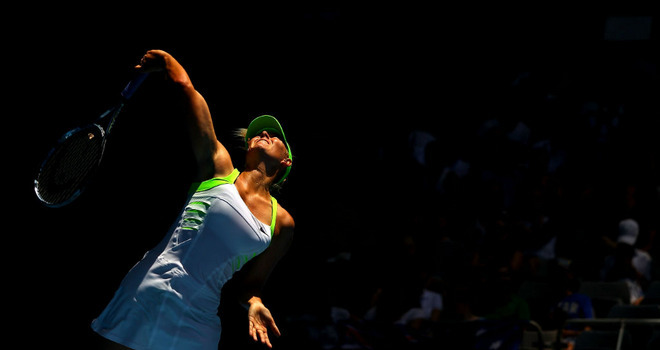 Sharapova was more than a marketing machine; she was a fierce competitor coming into her own. She was also a player who would have had precious few rivals until well, now, if not for her devastating injury. Maria Sharapova's shoulder injury negatively affected the trajectory of the women's tour for the last four years. Today's 6-1, 6-0 demolition of Gisela Dulko was the best match we've seen from her since her shoulder changed the game forever. Today Sharapova turned back the clock against Dulko, playing a set and a half of virtually flawless tennis. Dulko's no world-beater and she's been in a horrible slump of late, but she's certainly a class player, one who Sharapova shouldn't bagel in a 25-minute first set. Not this Sharapova anyway. This steamroller resembled pre-shoulder injury Sharapova. She cranked 14 winners and had 3 aces off a consistent serve that won points with placement as much as power. Then, as suddenly and unexpectedly as this vision of the past appeared, it vanished. The end of the second set was pure latter-day Masha. While not as ugly as it can get by any means, the first serve percentage dropped from 61% in the first set to 50% in the second, she went from winning 73% of her first serves to 62%, the unforced error count climbed from five to 11. In the end, though Sharapova didn't play nearly as well in the second set, Dulko mounted no resistance. I guess she was so embarrassed by Sharapova's flawless first eight games that she just wanted to get off the court. Today's first set was a glimpse of what could have been and a reminder of what is. Sharapova can still win, she's just not (for more than a set anyway) the dominant force we'd all expected her to be. Another player who isn't living up to (recently heightened) expectations is Samantha Stosur...well, I guess that really depends on your expectations of her. The reigning US Open champion came into Melbourne with just six wins (versus seven losses) since claiming her maiden major title. Worse yet, she played two tournaments in Australia prior to the Open, an extended homecoming tour, that netted just a single win in three events. It's an interesting thing in sports, some athletes love nothing better than home cooking, a familiar court and to bask in the glow of their adoring fans...whereas others can't get far enough away fast enough. Blogger Craig Hickman likened Stosur on Twitter to Amelie Mauresmo, the 2-time major champion from France that put up notoriously woeful results at Roland Garros (she never got past the QFs). Most of the top American players have done fairly well at home, but the difference is that in the US, tennis is a niche sport. In Australia, as in France, tennis (and particularly, their national majors) are front page news, not front page sports; front page period. American sports are primarily the province of teams. We know the stars, but the Yankees are more than Alex Rodriguez, the Lakers are more than Kobe Bryant. Stosur is well, just herself. Some players thrive under that glare, Roger Federer has a sparkling record in Basel (5 titles), Rafael Nadal owns the Barcelona tournament (6 titles), Steffi Graf turned the German Open into a virtual invitational (9 titles). Other players wilt. 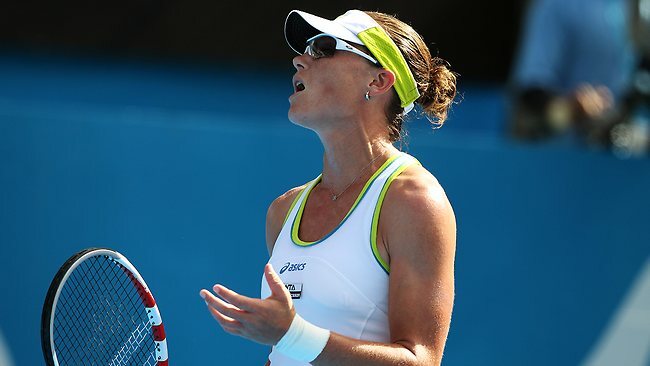 The question for Stosur is not how long she'll wilt, she's not scheduled to play again in Australia for a year, but how long will this hangover be? It's too long a season to be destroyed by a tough January...ask Andy Murray. 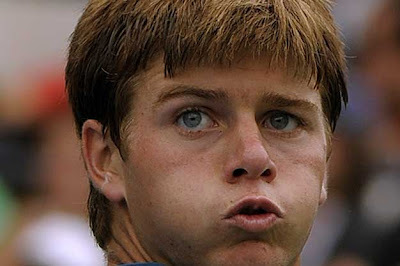 Also, ask Andy Murray what he thinks of Ryan Harrison after playing the 19 year old Yank today. At 6-feet even Harrison's a fair bit shorter than his fellow young guns Milos Raonic, Bernard Tomic and Grigor Dimitrov, but in his match today versus Murray, he showed he's big enough to compete (at least with today's elite players). In the first set versus the World No. 4, Harrison's game appeared remarkably complete and close to the level of Murray. More than a mere factory-produced ball-basher, Harrison's game is nuanced, there was a point in the 1st set where he hit a touch dropshot that sent Murray futilely scurrying toward the net after a solid baseline rally. There was, at one point, a 42 stroke rally with the typical ATP rocket forehands, plus Rafa-esque slice backhand pass attempts, plus topspin and so and so on...from both players...and Harrison won it. We all expect a grab-bag of spins and shots from Murray, but rarely do we see a young player (who can actually still hit the cover off the ball) able to exhibit such a wide variety of pace and spins. Where Harrison's game is not yet mature is in his fitness. Murray, the wizened veteran at 24, famously grew up on the Spanish red clay and once the Brit started moving Harrison around it seemed a foregone conclusion that the young American's legs would give in and that the rest of him would likely follow. Win or lose, this match was a great measuring stick as to where the next great young American hope is and where he needs to go. As with any young player, there's a lot of story to be written yet for Harrison. Will he stay healthy? Will he fall victim to his own temper? Will he put in the hard yards to compete at the highest echelon of the game? There are no guarantees in this game, no guarantee that you'll stay on the trajectory you're on; no guarantee that your home court will be friendly confines to nurture your game and certainly no guarantee that promise will turn into results, but that's why we keep watching isn't it? To find out just what happens. On to Day 3. As i purchase some sort of custom made check out I need to appreciate the best way replica chanel 2.55 appears to be most notably. When i get pleasure from a number of tasks of custom made wristwatches. Roman numerals deliver of which typical glimpse. A particular light experience intended for quick legibility is usually pleasant. I love to some sort of fake chanel bags household leather wedding band an incredible platinum or maybe silver human body. In essence I'm keen on the custom made wristwatches to get a great sense of balance connected with adobe flash in addition to polished category, that's easier said than done. Previous to When i investigate such considerations nevertheless there may be an issue that is usually both equally if not more significant. Of which certainly is usually model fake chanel acceptance. While using the surge connected with capitalism in addition to replica hermes way of life, this options for located include modified widely. Presently to help keep an individual's societal rank, the individual would need to shop rado replica variety of dollars with way of living merchandise. Make a list of all the items that can be chanel outlet 'Wardrobe Expanders', and take this list with you the very next time you hit the shops. Do you have clothes that invigorate respect from fellow workers, admiration from friends, and make you feel safe and confident? Sometimes we neglect the fundamental things that make a chanel outlet really work. For example, some women have hundreds of shoes but nothing to wear to work, while other women create a fetish for applications or purses but have no time to go shopping for well-fitted slacks. Try making a list of all the places you are likely to go in settled month. Then try to identify one or two different outfits that you would feel confident wearing to each event. See if you can make use of this chanel outlet to name any holes in your wardrobe that may need to be addressed. If you're uncertain what to wear to a particular event, call the person hosting to check out; she's going to appreciate the politeness. Everyone's needs will vary, so the most important chanel outlet is that you determine your own priorities. As a starting point, it may be useful to consider the following, which are considered to be wardrobe essentials by Diane, from the Paris, france Fashion Institute: A well-tailored white button down chanel outlet with a receiver collar. There are hundreds of variations, so choose one that highlights your shape.